Properties for sale in Normandy, France - AHIN-SP-001119 Nr Sourdeval 50150 Renovated Mill formerly a fishery with river and mill race in a quiet position with no neighbours for sale near Sourdeval in Normandy - ideal for fishing enthusiasts. This renovated mill is situated in a pretty location in the Brouains valley with the river Sée, known for salmon fishing, running through its land which extends to about 2 3/4 acres. 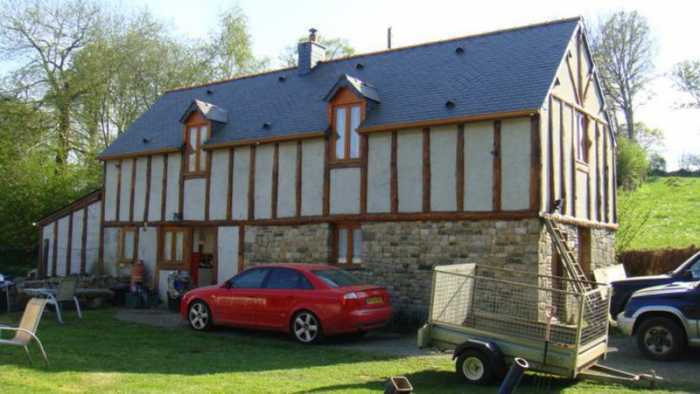 This property for sale in Normandy has been the subject of extensive renovation over the last 15 years and it now benefits from double glazing, an all water septic tank with pump and rewiring. The current owners have created a lovely home to suit their own requirements. At present there is only one bedroom but there is space for 3 bedrooms if required. It is situated in the southwest of Normandy, near the borders of Manche and Calvados, approx. 5 kms from Sourdeval, the nearest town. Only a few minutes drive away, the town offers every amenity including two banks and supermarkets. Market day is held every Tuesday morning, as is the livestock market. The beaches on the west coast are an hour's drive away and Sourdeval is approximately 80 minutes drive from the port of Caen and an hour and forty minutes from Cherbourg. A little further afield are the D-Day landing beaches, the Mont St Michel. The Lac de la Dathée, ideal for walking, fishing and boating, and an 18 hole golf course are within 15 minutes drive, as is the Saint Sever forest. Kitchen/dining room : 4.19m x 4.06m - Double aspect with "stable" door and window to the front elevation and window and glazed French doors to the rear elevation. Exposed stone walls. Galleried ceiling. Tiled floor. Fitted kitchen with matching base and wall units and ceramic butler's sink with mixer tap. Gas oven with 5 ring hob and extractor hood over. Built-in slimline dishwasher. Space for tall fridge/freezer. Radiator. Extractor fan. Spotlights. Inner hall : 2m² - Tiled floor. Shower room : 2.50m x 1.41m - Window to the front elevation. Tiled floor and 1/2 tiled walls. Corner shower unit with jets. Pedestal hand basin. Toilet. Radiator. Extractor fan. Utility room : 3.58m x 2.99m - Door and window to the side elevation. Matching base units with worksurfaces over and tiled splashbacks. Inset sink with mixer tap. Hot water cylinder. Tiled floor. Door and window to the side elevation. Space and plumbing for washing machine. Lounge : 6.70m x 4.19m -Triple aspect room with windows to the front and rear elevations and a window and door to the side elevation. Electric fusebox. Exposed stone walls. Tiled floor. Woodburner. 3 radiators. Stairs to first floor. Bedroom : 7.19m x 4.54m - Triple aspect with windows to the front and side elevations and velux window to the rear elevation. Galleried ceiling with exposed beams. Wooden floor. Exposed stone wall. Sloping ceiling. Gallery landing : Wooden floor and wrought iron balustrade. Bathroom : 4.21m x 2.26m - Window to the side elevation. Wooden floor. 1/2 tiled walls. Roll top bath with mixer/shower tap over. Pedestal hand basin. Toilet. Radiator. The property is approached via its own driveway which leads to the front of the house. There is a detached block built barn with a slate roof (approx. 9m x 5m) and 2 windows to the rear elevation. Across the other side of the lane is a builder's yard/storage area/parking spaces. There is on old water wheel and the constant sound of running water.